Rinse the roast and dry thoroughly. Cut slits in the roast and insert garlic cloves. Mix together paprika, brown sugar, garlic salt, and cayenne pepper. Rub over pork. 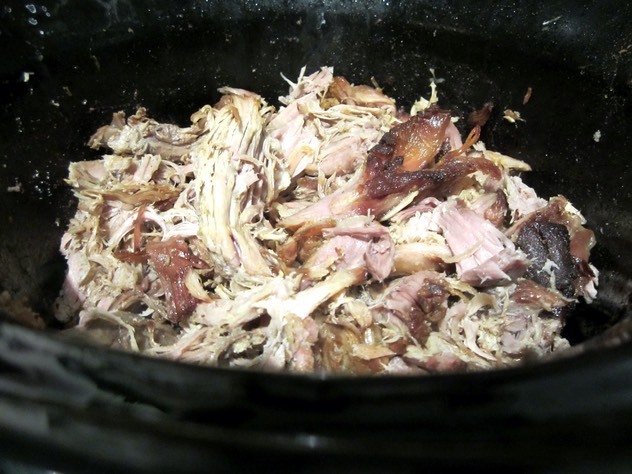 Put pork roast in a crockpot set to Low. After 6 hours remove roast and pour off all accumulated liquid. Return roast to crockpot set on Low. After about two hours you can remove the bone and shred the meat a bit to get more browned bits. Depending on the size of your roast it should be perfectly cooked in 10 hours. Any extra cooking time is for additional browning.